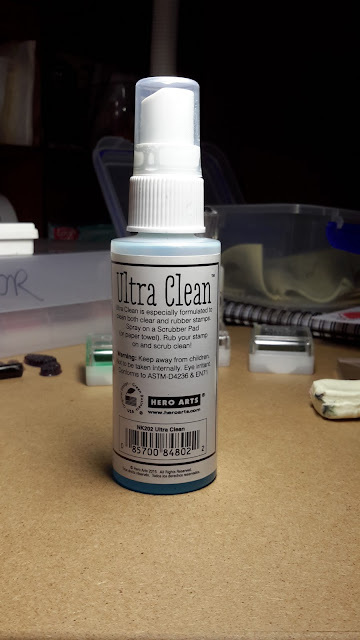 There are lots of products out there for cleaning our stamps, like Wet Ones (other supermarket brands are available... lol) but I know a lot of people like me find that they leave tiny fibres on our stamps. ... their Ultra Clean fluid, but after a while I find the pad is so full of ink that I still need paper towels and a further spray of the fluid directly onto my stamp to fully clean it. I know there are 'official' Stamp Shammy cloths available but I have found a cheap alternative in the UK that you might be interested in. 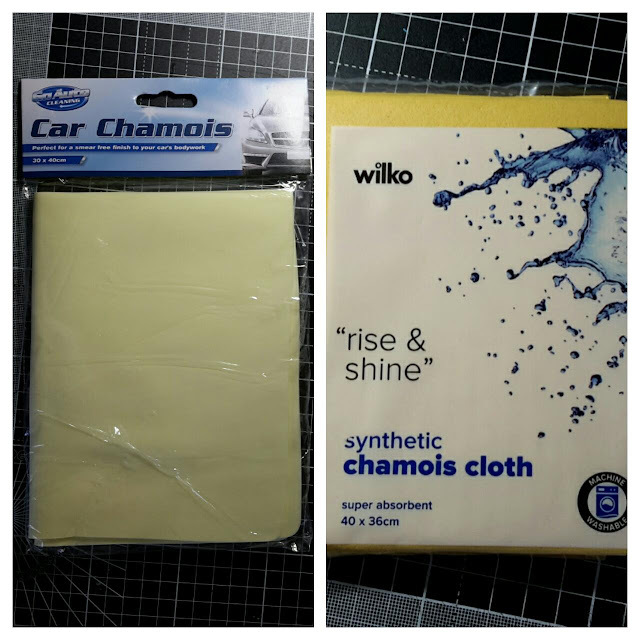 This is a car chamois cloth from Poundland (UK), so costs £1.00. It's about 14" x 11" and I cut it into 4 pieces, each about 7" x 5.5" (so 25p per cloth!!!!!!). I ran one bit under the tap to dampen it and now keep it on my craft desk in a little box to stop it drying out. 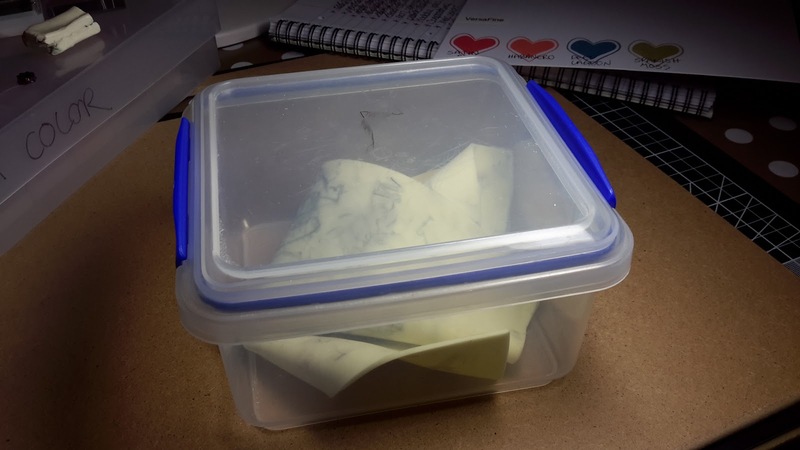 If it does dry out then it goes hard but that's no problem, run it under the tap again to soften it, I just keep it in a box so it's always available. 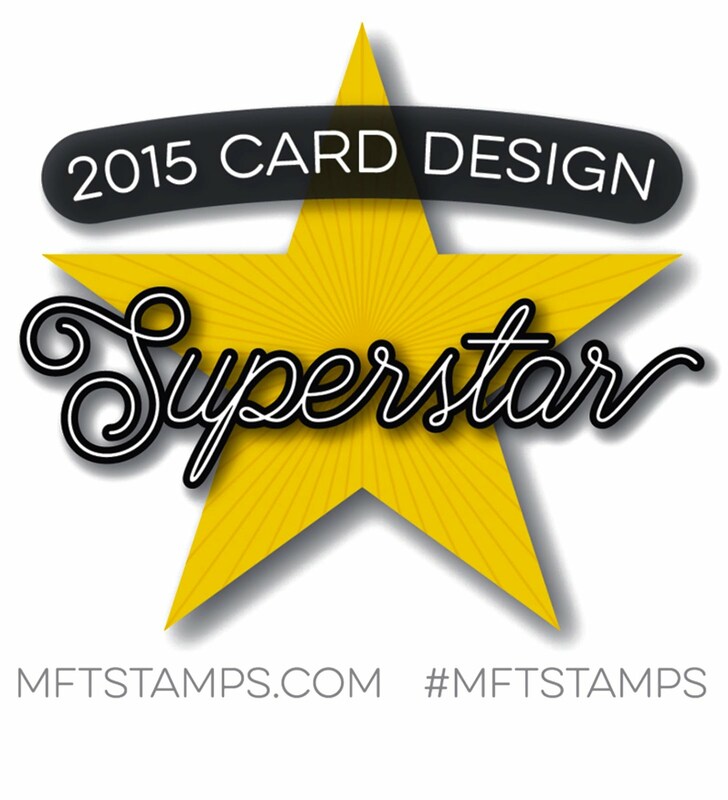 It cleans my stamps perfectly, first time, every time. The ink doesn't gunk up the cloth, it just absorbs it...no inky fingers, no inky build up and no fibres stuck to my stamps. 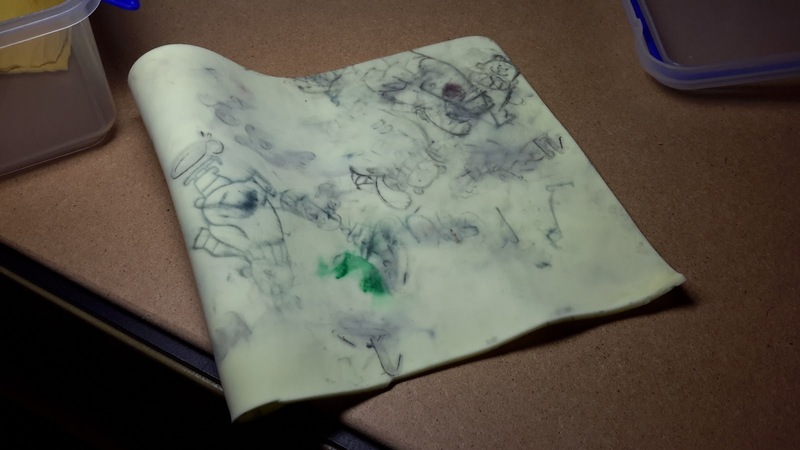 Here's the piece I'm using at the mo', as mucky as it is, none of the ink transfers onto my fingers and it still cleans my stamps. 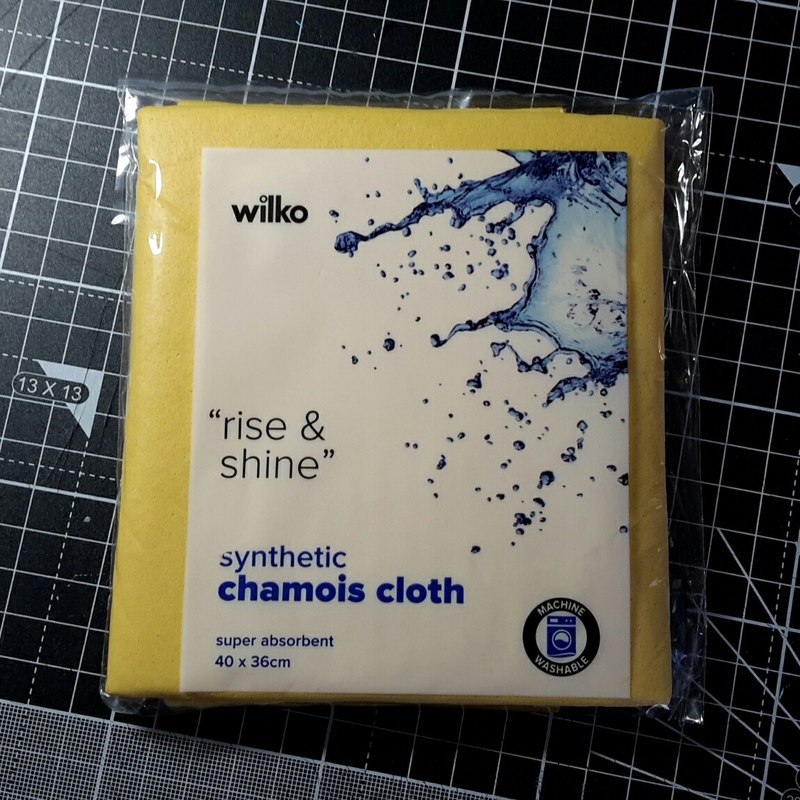 I also tried this cloth from Wilkinsons (UK), another synthetic chamois cloth. It measures approx' 15" x 13", so can be cut into about 6 pieces and at £1.25, this is another bargain buy. It needs rinsing through before using as it has a 'soapy' feel to it, but just run it under the tap first and you're good to go. 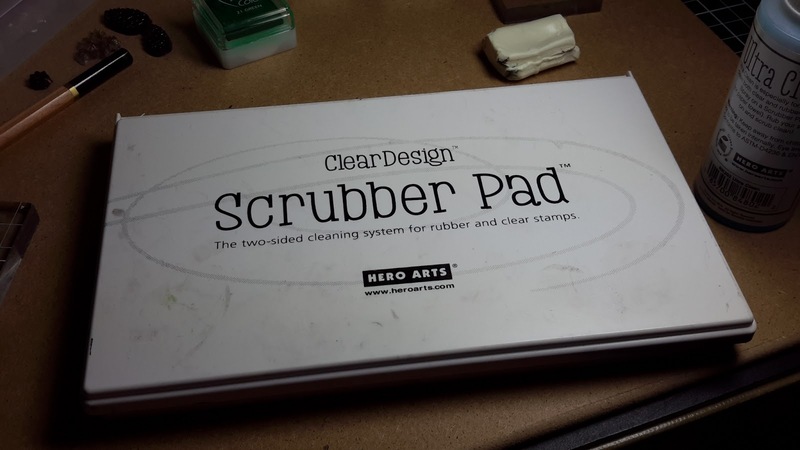 Both cloths are brilliant for cleaning stamps. I balked at getting an official sham my for some time but finally gave in and I love it. I will have to check the auto store once this one is too mucky! Thanks for the tip! wished I lived in the UK so I could buy it!! ..I have SO many problems too..with cleaning my stamps...even have 3 stamp scrubbers for different colors..I wash them often out..but after a session of stamping they get dirty..and so my stamps do'n get clean..I dislike that so much..
the baby wipes..oh my all those hairs after cleaning..horrible..dirty fingers too ! I bought the expensive Lawn Fawn cloth and started with it yesterday..I think it is better ...then all I have tried..but would love to try this cloth!! Hi from the U.S. Jane. I was getting so frustrated with all the fibers left from baby wipes and was looking for a good alternative to those and the stamp cleaning pads when I 'discovered' the stamping chamois-was pricey, but I ordered it anyway. 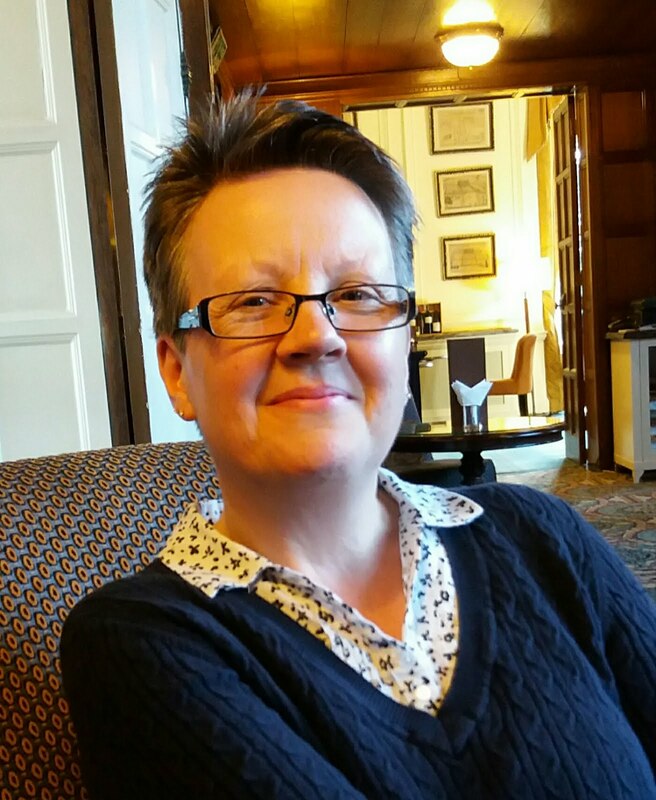 When I got it I really liked it, but it wasn't very big and I wanted an alternative. 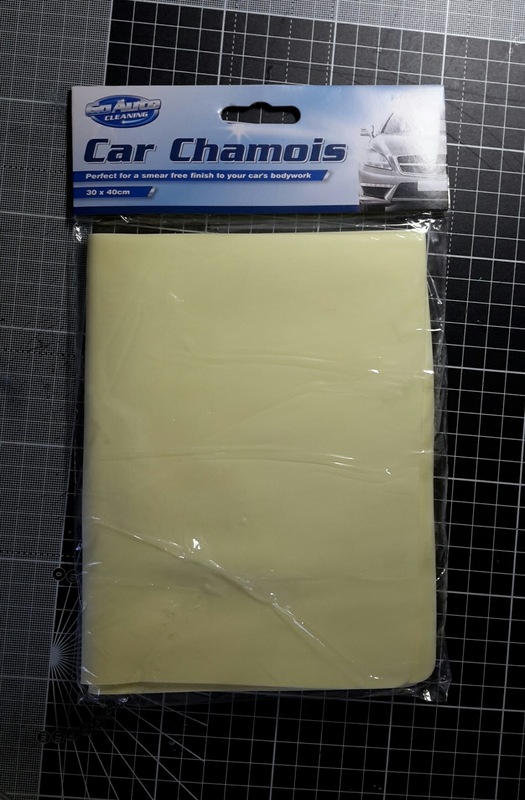 My husband saw it and said he had something like that in the garage-car chamois! So next time we went to the big box hardware store I purchased one of those for $5. I cut it into 8 pieces and shared it with my craft group. They love them, too. I keep mine in the old case from my scrubber pad that fell apart. 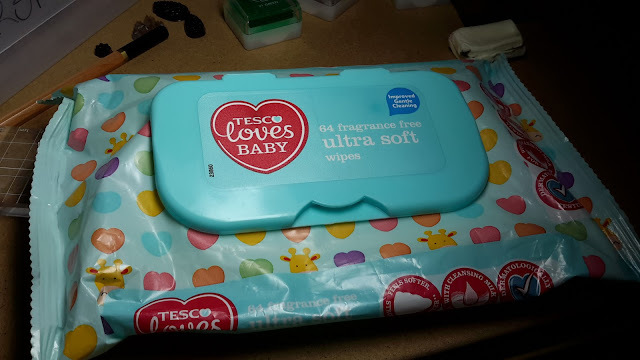 Thanks for the tip about the baby wipes... I was wondering where those fibers were coming from. I'll try the chamois instead.